By way of vintagevectors.com come these 3 free vector art graphics. Scanned from public domain sources, we are pleased to make these highly detailed heraldic crests available to the graphic arts community. 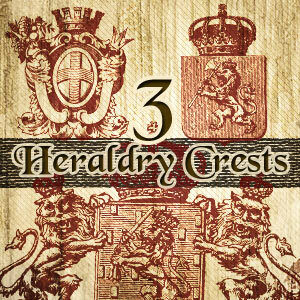 All three have jeweled crowns atop a shield crest. There are lions holding weapons on two emblems. Also represented are a trident, cornucopia and cross. Two of these free vectors have customizable banners for adding your own messages. Big thanks to vintagevectors.com for allowing us exclusive permission to post these awesome vectors! Thanks a bunch! These a nice old pieces..
Gorgeous share! You are talented! i wish i could do that…..
thx 4 shared with us….